← al-Bashir Defies Warrant, Visits Chad. So What Now? Welcome to Justice in Conflict! Karl Marx once exclaimed that “the criminal produces not only crimes, but also criminal law, and with this the professor who gives lectures on criminal law.” Clearly, then, the criminal also produces bloggers. Welcome to Justice in Conflict! The impetus behind this blog is to provide an engaging, open and stimulating forum where we can discuss and debate the issues, problems and challenges of pursuing justice, especially transitional justice. The name of the blog purposely has a double-meaning; this site will provide a space to consider conflicting conceptions and demands of justice as well as the role and effects of pursuing justice within conflict situations. The blog is also inspired by my own academic work and professional interest in how societies reckon with past human rights abuses. I am currently a PhD student at the London School of Economics where I study the relationship between peace and justice through two case studies of the International Criminal Court’s investigations in Darfur and northern Uganda. I hope to share the insights and experiences I gain along the way on this blog. The photo in this post is of defendants from the International Military Tribunal for the Far East, better known as the Tokyo Tribunal. It was set up following WWII to try Japanese perpetrators of crimes against humanity and war crimes. 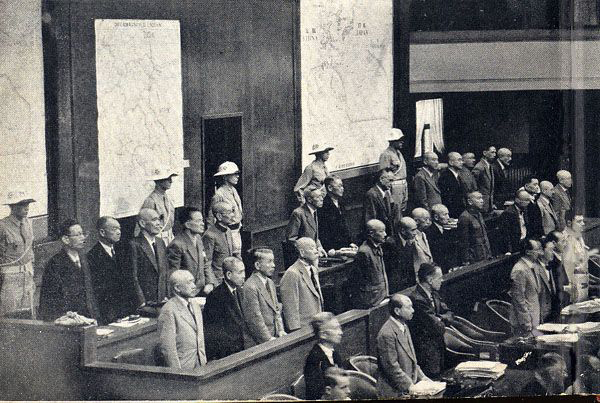 In comparison to the infamous Nuremberg Tribunal where senior Nazi officials were put on trial, the Tokyo Tribunal has escaped sufficient analysis and debate. On this blog I hope to discuss some of the issues surrounding international criminal justice and conflicts that escape the attention they deserve. While this blog will often explicitly or implicitly deal with legal matters, this is not a law blog. Instead, the focus here will be on the politics of international law and transitional justice and how they relate to the dynamics of violent political conflicts. I hope to touch on ongoing debates about human rights, international criminal law, transitional justice, conflict resolution and peacebuilding. There is still a lot of work to be done to get this blog up to speed but I hope to produce material regularly in the very near future. I hope you enjoy the blog and thanks for taking the time to read! 1 Response to Welcome to Justice in Conflict! Good luck with this blog. Whatever you do, don’t stop writing!